﻿​Paddy Power is the most popular sports betting app in the United Kingdom. Live streams of racing from the UK, Ireland, Dubai, South America and Africa. Paddy Power is one of the largest online bookmakers in the world and the largest based in Ireland. 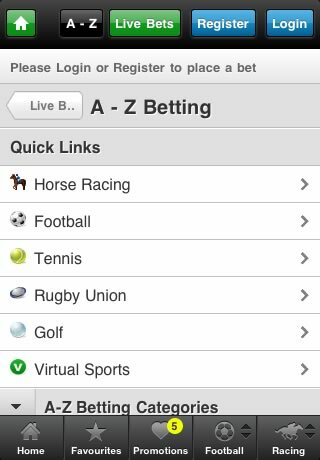 Paddy Power is known for offering some of the best odds online via their “money-back specials.” The bookmaker was one of the first to offer mobile applications, with their apps premiering in early 2010. Paddy Power was formed all the way back in 1988 after several Irish bookmakers merged to form the company. They are a bit unconventional compared to other bookmakers, offering better odds and tons of ways for players to earn their money back. They have been expanding their customer base ever since they opened their first betting shops in the 1990s. Paddy Power is a publicly traded company on both the Irish and UK stock exchange. Their parent company is Power Lesiure. Headquartered in Dublin, Paddy Power is licensed and regulated by the Alderney Gambling Commission. They are highly trusted by both punters and industry experts. In addition to sports betting, Paddy Power offers players an online casino, poker, games, and bingo. The mobile platform currently supports sports betting and casino play. The Paddy Power application is one of the more high-tech betting applications around. 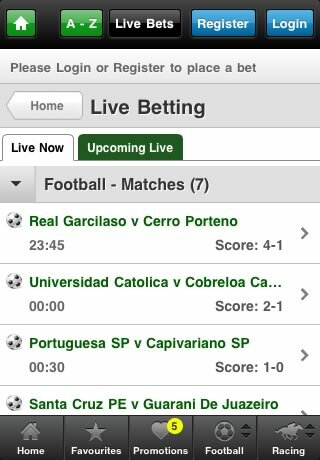 It offers bettors loads of features and is one of best mobile betting applications on the market. Players can bet on mostly every sport and many offer special features. Horse racing bettors will be right at home with the Paddy Power app. They offer live streaming of races from the UK, Ireland, South American, South African and Dubai tracks. Many online bookmakers do not offer live betting or in-play betting from their mobile application. 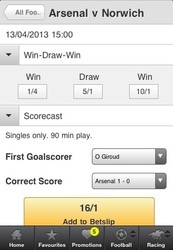 Paddy Power offers this feature, and it has one of the better live betting interfaces around. Now bettors can bet on events as they happen from anywhere in the world. The top 10 most popular markets are listed on the home page and players can also bookmark their preferred markets via the favourites tab. They will also be able to take advantage of Paddy Power’s many promotions from the mobile application. 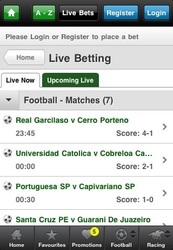 One of the coolest features is the ability for bettors to point their mobile’s camera at a televised football match. 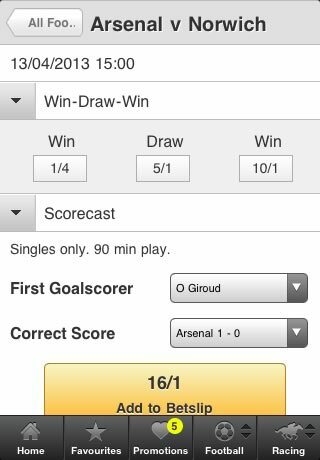 The Paddy Power application will recognize the match and instantly bring up live odds. Bettors can log into their accounts (or register for the first time), view their open bets and previous wagers and bet with ease via the mobile application. Depositing and withdrawing are easy, and players have most of the same deposit options that Paddy Power offers from their main site. 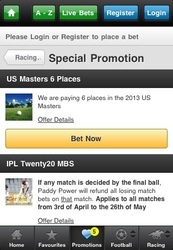 Paddy Power is ahead of most of the competition with their mobile app. While it works flawlessly from a technical perspective, it looks marvelous, as well. The green-white color scheme is something that Paddy Power customers are used to and obviously fits since they are an Irish based bookmaker. The layout is polished, but not flashy and is extremely simple. The app is not cluttered and has just a few buttons across the top and bottom of the screen. 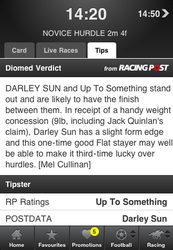 In fact, compared to their normal web page – we honestly think the Paddy Power mobile app has a much better layout. It is easy to get where you want to go, bookmark your favorite markets and take advantage of promotions. It reminds us of Paddy Power themselves, even though they make their money from people losing at sports betting, they are not out to deceive bettors like many other bookmakers. Their money-back guarantees and promotions are listed on the front page of the application, giving all customers a chance to take advantage of their best offers. Paddy Power is more of an Irish and UK centric bookmaker so the emphasis of a lot of promotions will be on Football and other UK/Irish sports. However, fans of other markets will not be left out as Paddy Power has one of the largest lists of betting markets in the world. The mobile application offers all these markets and promotions to go along with them. 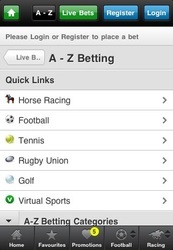 The app offers A-Z Betting on mostly every sport in the world. Football and Rugby have tons of different markets, but lesser known sports do as well, like American and Canadian sports. Paddy Power is also famous for their novelty or political bets, and these will also be available for mobile users. 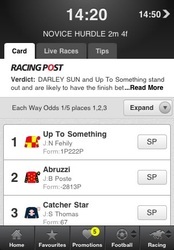 However, this only scratches the surface of the bets and offers available at Paddy Power. Few online bookmakers have the storied history that Paddy Power has. The company has been at the forefront of sports betting since the 1980s and was one of the first to premier mobile applications. Their mobile product is now one of the best in the world, and they are still updating the client frequently. Paddy Power is an excellent choice for punters everywhere. They understand that looking out for their customers is the best way to stay on top.